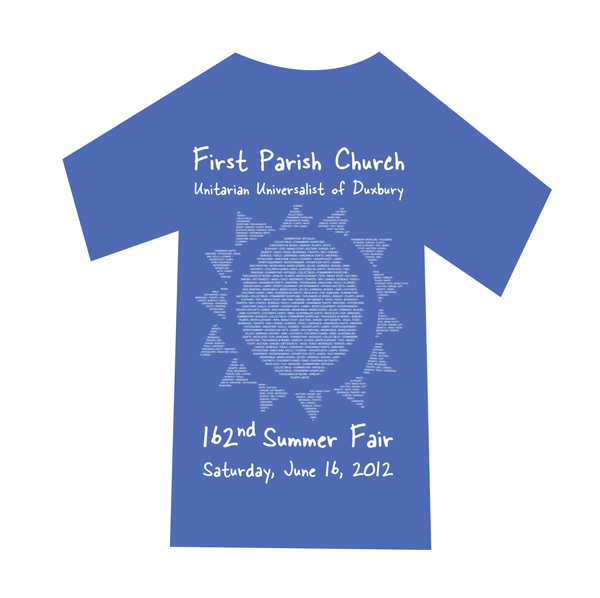 Every year, First Parish Church holds their big fundraiser, the annual Summer Fair. It's the oldest summer fair in continuous operation in the country, and it is wonderful! So every year, we've got to come up with a better, flashier, more eye-catching design for the t-shirts and posters. This year we went for a periwinkle blue background, and a graphic of the sun (for summer!). It's too small to see here, but that sun is made up of all of the items you can find at the Fair, such as antiques, strawberry shortcake, games, music, White Elephant treasures, books, sports equipment, and so on. Now, what to do for next year? we’ve designed t-shirts for special events. or hats. coffee mugs. cozies. mouse pads. pens. what do you need?